When you've gotta go, you've gotta go. 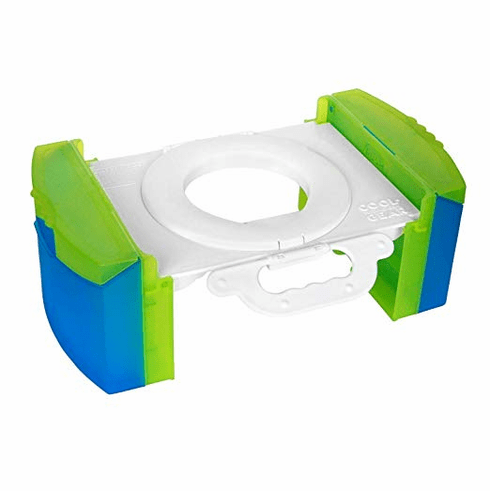 And when there's no clean restroom in sight, you'll be very thankful you brought along this handy little travel potty. Durable and lightweight, it folds up to the size of a small briefcase. To use, simply pull the recessed grips to open, slide the sides down, and lock into place. Lift up the seat, insert a resealable gallon-sized storage bag over the lid, and then close the seat to lock the bag in place. When your child is done, remove the bag, seal it shut, and dispose of the contents. The seat even has two storage compartments on either side to hold the bags, wipes, and a change of underwear or training pants. Open dimensions: 12 1/2"L x 10"W x 6 1/2"H. Folded dimensions: 12 1/2"L x 10"W x 3 1/2"H.
Easy to use and carry, Folds to compact briefcase size. Two large compartments provide room for storage. Use with any 1 gallon bag.